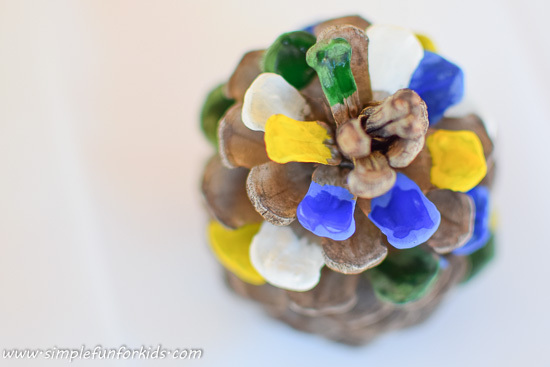 This morning, we had about 15 minutes before we needed to go somewhere, so we decided to do a super simple, quick family art project on a natural canvas that’s plentiful in our backyard: Painting Pine Cones. then got out our tempera paint and a few paintbrushes and got to work. 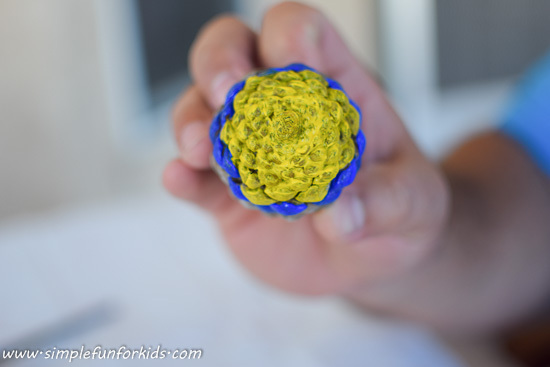 before showing off his creation – he called it a flower! E was really happy to get to do an art project with both Papa and Mama and used all the colors we had, starting at the bottom like Papa. she immediately grabbed another one and announced that she was making a “space ship”. 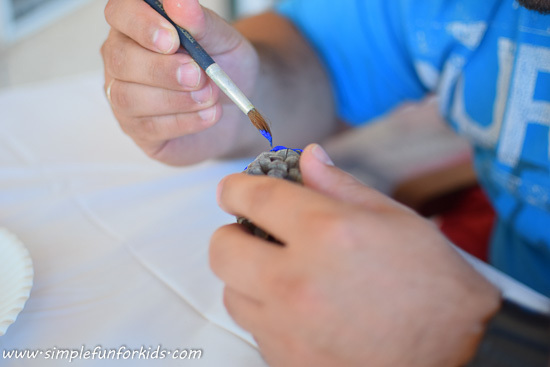 This activity was just right to enjoy 15 minutes together as a family and connect while being creative – super simple, quick to set up and quick to clean up! 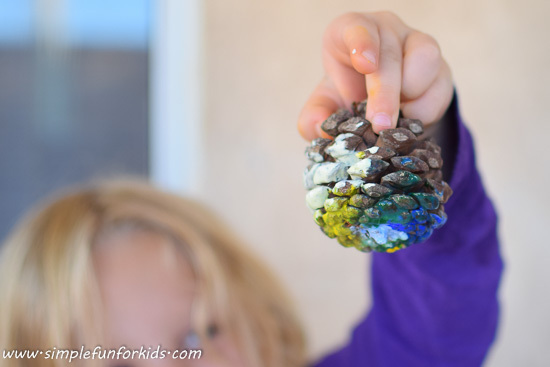 Pine cones are an interesting surface to paint on and can spark creativity in different ways. 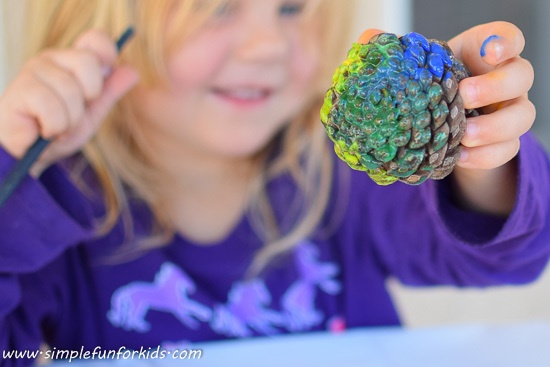 Have you tried painting pine cones? What else have you done with them? Leave a comment with your ideas! I haven’t tried this before, but it sounds fun! 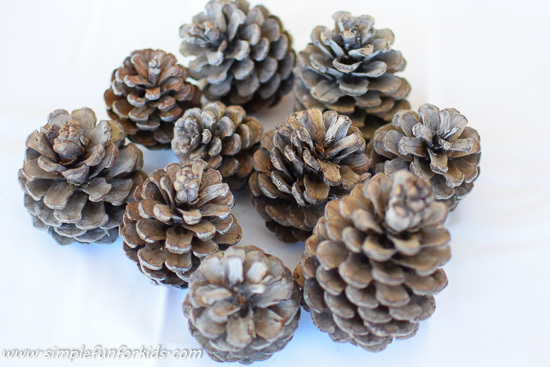 There’s no pine cones in my yard so I’d have to go and find some, but I bet my son would enjoy this. 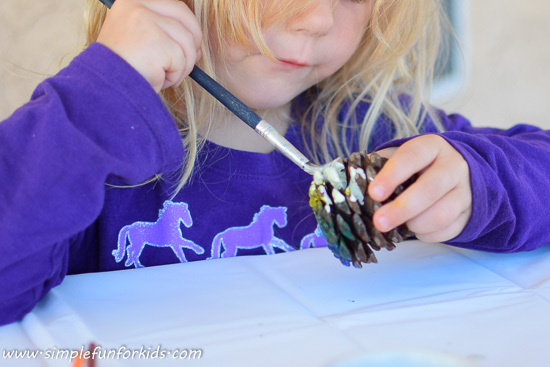 Last year I painted pine cones a dark green. Glued craft jewels on the tips. Added tinsel ribbon for garland. Gotten small flower pots from the Dollar Tree. Glued the pinecone to the pot. They looked like mini Christmas trees. Really cute. Wow, that sounds awesome! We’ll have to try that later this year! Cute idea! Thanks for sharing! This will be a great craft for Christmas next month! I was just going to mention- I’ve heard you can put pinecones in the oven for a bit before you decorate with them so that you don’t bring critters into the house. Thank you, Lynda! 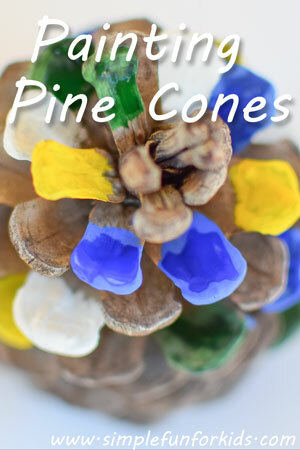 I’ve never had trouble with infested pine cones, but baking them sounds like a good idea to be sure.